Tomorrow (Monday, July 11th) Practical Scrapper is doing a feature on cupcakes. Be sure to head over there for some great inspiration. 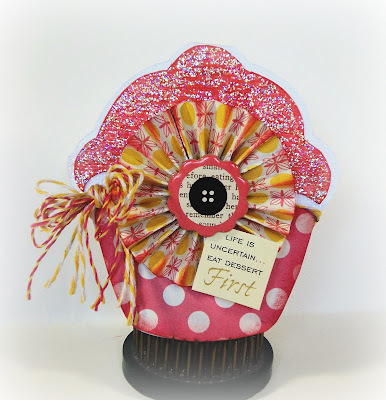 I thought I'd share my cupcake card today to get you in the mood! 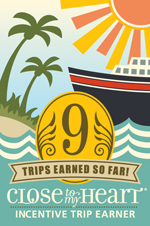 I incorporated a couple of challenges into this card. CARDS is looking for cards with baker's twine, and CAS-ual Fridays is looking for shaped cards. I made this card using my Slice - the Parties design card. I created a white base and then paper pieced the wrapper and frosting. The frosting is actually a white piece that I sponged with CTMH Smoothie ink. Then I used some CTMH glitz glitter gel so for the sparkle. Wow, this is a fantastic card, love the rosette! oh I LOVE this!!! Super yummy and CUTE!!!! how fun!!! I love the polka dot cake case and the bakers twine tie! A lovely card! Your card is adorable and yummy too! Super cute!! Glad you joined the fun at CAS-ual Fridays!